A century after the modern automobile evolution era, it is unbelievable to see how technology replaced the classic vintage cars with ultra-sophisticated sedans featuring a bunch of matchless features. Thanks to that, your compact cars now can respond to voice commands and synch with smartphones through integration systems to offer better navigation, connectivity, and responsive cruising. Compact car shoppers no longer rely on the top-American or Japanese brands and are most-likely to exclude the much-hyped sedans: Honda Civic and Toyota Corolla off of their best-sedan lists. 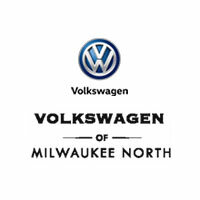 With Volkswagen Jetta as a new entrant in the market, which is popular for its marvelously designed exterior, composed chassis and astounding multimedia features, the competition is even more fierce. The all-new 2019 Jetta, with its improved look, revamped security tech, and a host of unique modifications, is all set to vanquish its traditional counterparts: Corolla, Civic and Cruze. 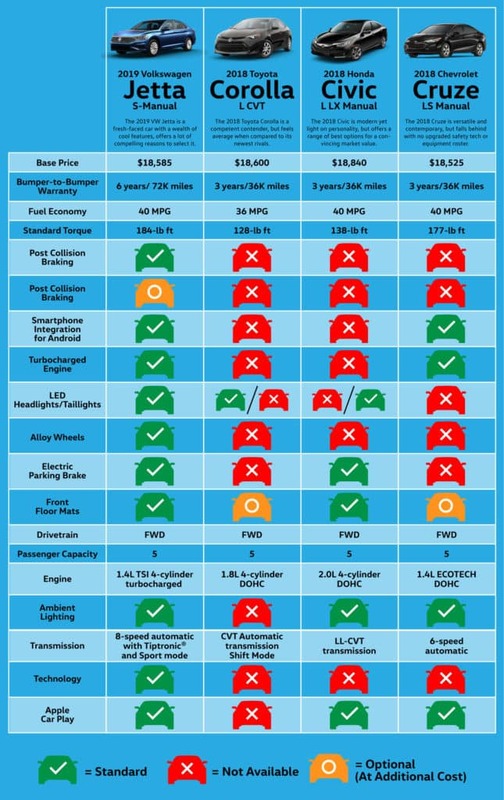 Let’s look into these cars with this comparison table. While Cruze is the cheapest among these four sedans, but it only outwits the 2019 VW Jetta by a mere $40. Both of them share the top rank with the Honda Civic with the highest fuel economy of 40MPG. The new Jetta, however, with its Cross-Differential System XDS®, 8-speed auto transmission and sport mode, and superior 4-cylinder turbocharged engine, quickly achieves an impressive 40 MPG by generating a dynamic 147 horsepower to offer the drivability that you will miss with a Corolla, Civic or Cruze. Seemingly, the Corolla misses the mark in this competition despite of its popularity as a top economic sedan in the auto market. VW Jetta is a clear winner considering the other incredible inclusions such as the nation’s best 6-years of bumper-to-bumper warranty, unique multimedia and smartphone integration technology, and the post-collision braking. On top of that, it’s impressively trendy, beautifully built and is fun to drive. On top of being a cool car to drive, the new VW 2019 Jetta is a revamped car with a renewed exterior and a whole new setting on the inside. The newest Jetta has a user-friendly color touch screen for passenger infotainment. Apple and Android users will be excited to know that the new German compact sedan is equipped with Apple CarPlay ™ and Android Auto™ for easy connectivity, entertainment, and communication on the road. Passengers will have the choice to synch their smartphones with their jetta through mobile apps, such as: iHeartRadio, Google Maps, Disney Radio, Pandora, Sportify and MLB At Bat. BeatsAudio™ is another exclusive feature in this newest VW Jetta, which allows passengers to enjoy music streaming, without any interruption and static noise. The newest Volkswagen Jetta, with its all-new Digital Cockpit, makes you comfortable on your driver’s seat with every information available at your reach. Customize what’s on the display, everything from route guidance to the estimated fuel economy, just with a touch. The dynamic 8” navigation interface keeps you informed with detailed route information and turn-by-turn guidance. When it comes to road safety and responsive driving, put your safety in the good hands, and with such incredible upgrades in safety features, Volkswagen Jetta surely crushes all the three competitors without giving a second chance. As the brand’s one of the best-selling sedans, the all-new revamped 2019 VW Jetta is all set to rule the market. It’s hands-down stylish, efficient, robustly built and moderately priced. With five trim choices, including the most popular R-Line, S, SE, SEL and SEL Premium, two leatherette seating surfaces, alloy wheels, premium metallic finishes, and nine vibrant color choices, this impressive compact sedan outweighs its most common competitors. And with the “build-your-own” option, customers can hand-pick all top features from exterior colors to interior ambient lightings to create something unique, customizable and enticing to drive.